Schneider’s relapse has been a foregone conclusion since the end of “The Man.” In fact, the biggest reveal of this episode wasn’t that the goat-yoga enthusiast had fallen off the wagon — it’s that he started drinking before, not after, his climactic blow-up with his father. The painful irony of this sobriety setback is that the one drink Schneider took gave him the courage to stand up to the man who drove him to alcoholism in the first place. It was a short-lived victory, because no matter how skilled Schneider is at hiding his drinking — he still manages to dupe a skeptical Penelope and Lydia during the first third of the episode — eventually he was going to spiral out of control. Even he knew back in season two’s “Hello, Penelope” that one drink is too much for him. Without getting too personal, Penelope’s frantic tenacity is not foreign to me, wanting so badly for your suspicions about a loved one’s addiction to be unfounded. So, thanks, ODAAT, for not being afraid to display that level of persistence. Much as I loathe to admit it, there was a small part of me that was convinced during the first section of the episode that Schneider wasn’t drinking — that’s how good Todd Grinnell is in “Drinking and Driving,” and that’s how good addicts can be at hiding their problem. It was the knowledge that this kind of buildup only leads to one possible outcome that kept me from being surprised when Lydia finds a liquor bottle hidden in Schneider’s yoga mat. So, yeah, things got pretty bleak as Grinnell takes his irrepressibly goofy trust-fund baby character to a dark place that previously had been only hinted at once Penelope and Lydia uncover his secret. It’s not that he all of a sudden gets to go dramatic with Schneider — between “Hello, Penelope” and the season-two finale that’s well-trodden territory. For the first time, audiences witness Hostile Drunk Schneider, a man so broken and ashamed that he angrily shoves Alex — who discovers his pants-less buddy crumpled on the laundry-room floor — after the teenager offers to get him some help. The last thing Schneider wants is to lose the trust of the Alvarezes, so he begs Alex not to tell his mother. But, in case I haven’t said it enough in these recaps, Penelope has done an excellent job raising her son to be a good person, so of course he alerts his family to Schneider’s whereabouts. On that note, this episode alone is like Alex’s Responsible Human Being Final Exam: Not only does he keep a cool head when dealing with an antagonistic Schneider, he also talks Elena down when she suffers an anxiety attack right before her driving test, encouraging her to think about “that Supreme Court lady you like, Darth Vader Ginsburg.” His maturity is rewarded by Penelope, who lifts his four-month-grounding sentence as of the strangely appropriate time of 4:20 p.m.
We know that Schneider has hit rock bottom before, but there is a difference here. He’s got the support of a real family behind him now. As usual it involves a comforting bowl of Lydia’s sopa de pollo — and some tough love from Penelope that has the potential to be far more beneficial than an aloof daddy footing his multiple rehab bills. Also, just as he has been Penelope’s best non-professional coach for her mental health, now it’s on her to return the favor. She provides the sympathetic words he needs (“I’m not giving up on you. None of us are”), and she gives him a clear goal to work toward, which is something I highly doubt he had during any of his previous rehab stints: Going back to Alcoholics Anonymous meetings and taking charge of his sobriety will make him a good role model for Elena and Alex. Since Schneider has never had such a lofty ambition for himself before, I have a good feeling he’ll be more determined than ever to keep this promise to himself and to the Alvarezes. Besides, with Joe Manganiello (who appears as Schneider’s sponsor, Nick) a regular presence at those AA meetings, a flirty Penelope is going to ensure that Schneider never misses a single session. Not one. • After nearly three seasons, it has finally been established that “Dwayne” is not the first name of Todd Grinnell’s Schneider: He introduces himself at the AA meeting as “Pat.” This is another nice homage to the late Pat Harrington, Jr., who portrayed Dwayne Schneider in the in the original One Day at a Time. • When Schneider plays his didgeridoo (badly) for Lydia and Penelope, he brags, “And not one lesson.” Given that Ferris Bueller’s Day Off star Alan Ruck played his father two episodes ago, it’s hard not to think of Ferris’ nails-on-a-chalkboard clarinet demo (and similarly worded boast) in that moment. • Avery doesn’t appear in “Drinking and Driving,” but we do find out that she and Schneider broke up sometime after he fell off the wagon. It might be for the best, as he needs to focus on his sobriety. • If ODAAT is renewed for a fourth season, I hope the show delves into Elena’s anxiety more, especially with college looming. • Heh, Lydia made a Law & Order joke. 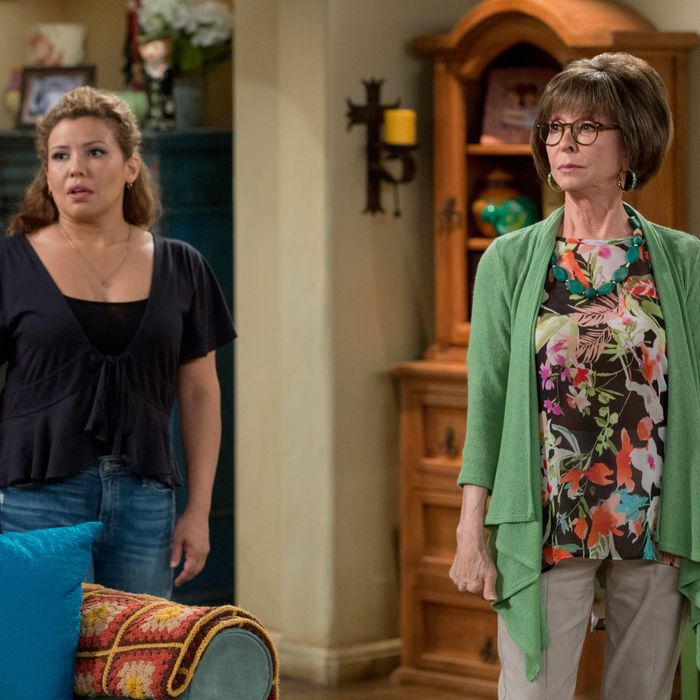 • ODAAT hasn’t been overtly political this season, but it’s hardly necessary when Lydia confuses “the president” with a hemorrhoid commercial, and Elena makes a comment about “our frail democracy.” We know where they stand.